First class meeting. Browse some of the key books related to the course. View several approaches to motion capture starting with a brilliantly cynical warning of the type of mocap abuse we hope to avoid. The three following videos include scenes created via the PhaseSpace mocap system at CalArts. The remainder of the videos are selected to serve as examples of other approaches to motion capture that extend the possibilities beyond the conventional. Some of them are mere motion graphic exercises and others are much more. All are useful examples for contemplating the possibilities of what we might do. After the screening we will discuss each student’s interest in motion capture with some projections on directions the course might take to best serve them. Second class meeting. View and discuss Sara Pocock’s mocap test and the documentation promo from Robert Abel and Associates historic 1985 production, The Making of Brilliance. View and discuss video documentation of the 2013 Mocap for Artists Course Exhibition. Examine the components of the PhaseSpace Impulse system and learn to propagate the spandex suit with markers. Suit up a student and explore several ways the live data may be viewed in the PhaseSpace Impulse software. First and last assigned reading of the semester: Maureen Furness’s comprehensive paper, Motion Capture. Third class meeting. Postpone originally planned demo of Oculus Rift and Unity until later in the semester. Suit up a student. Discuss ideal marker placement positions vs. positions on actual suit available (especially noting the disadvantages of our older suit design where the leg marker velcro pads are located on the front of the leg rather than preferred position on the side). View markers in the PhaseSpace Master program and demonstrate how to do a live data performance with the Master program. Observe the ranges of marker jitter and data loss. View the the marker grid in the Tracking Window to confirm marker drop out (flickers from green to white) and complete marker loss (turns from green to red). Have fun with using the suit data with the path traces of the PhaseSpace Painter program. Discuss the advantages found in the creation of rigid bodies formed from a selection of markers, for example, how a rigid body created from four markers on the head allows for rotational data as well as translation data and the added reliability of having any three visible markers maintain the positional data for the head. After the class break jump into using Master with MotionBuilder without a prepared and rehearsed demo. Fun with incorrect mappings, etc. Fifth class meeting. Presentation: Chronophotography: The Seminal Work of Étienne-Jules Marey and Eadweard Muybridge in Relation to the Development of Digital Motion Capture. View and discuss sections of Norman McLaren’s 1968 film, Pas de Deux as an example of the influence of Marey and Muybridge on McLaren and other artists, such as Butch Rovan. Suit up a volunteer student for a capture session. Have students log into the F105 lab workstations, launch Parallels, start Windows, and open the PhaseSpace program Master. Work with the performer to capture a T-pose and some motion data. Students open Autodesk MotionBuilder and import the PhaseSpace generated marker data. 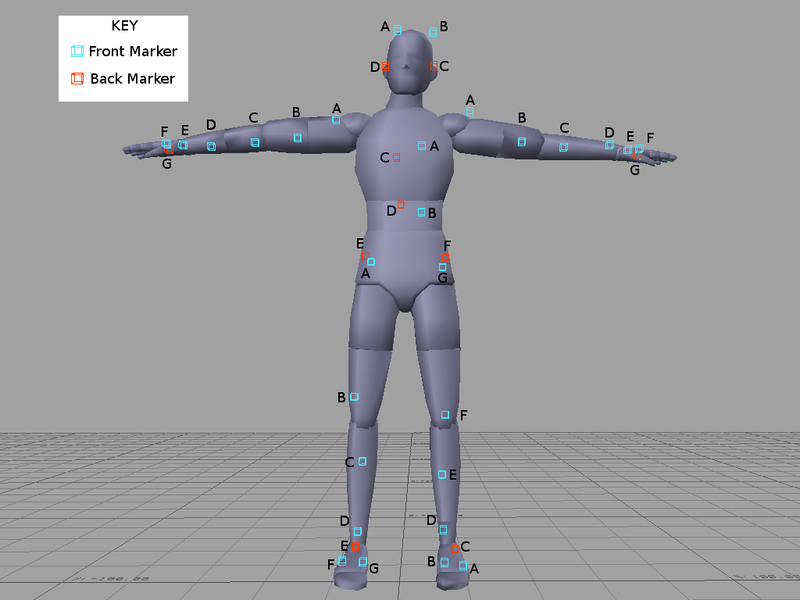 Assign markers to the MotionBuilder “Actor”. Create rigid body marker sets. Import a MotionBuilder “Character” and assign the “Actor” to drive the motion of the “Character”. Work in real-time to view issues with the data mapping onto the “Character”. Use the “Plot” function to bake all the motion data onto the skeletal structure of the “Character” to save the rotations and translations as key-frames (every frame is considered a key-frame in this case). Export the key-framed scene as a .fbx file. Import the .fbx file into Autodesk Maya and discover ways it my be used. Fifth class meeting. Michael McNeff added the OWL plugin to MotionBuilder on the F105 systems so that students could follow along with demonstrations on running a PhaseSpace capture session with MotionBuilder. Gina volunteered to suit up in the newly modified capture suit (a stopgap suit until we can purchase one of the new and improved versions). Students learned to add the PhaseSpace server IP address to MotionBuilder, record a T-Pose and walk around, load the “actor” model into the scene, create a marker set, add select markers to the “actor” nodes, create appropriate rigid body marker sets, activate the actor, add a “character” to the scene, set the “actor” to drive the “character”, and record a take. Sixth class meeting. Demonstrate use of Autodesk Character Creator for creating modified character designs from templates for use in MotionBuilder and Maya. Have students log in to Autodesk and set up a free account in order to access Character Generator. Create “favorite paths” for the “clip art” stock character folder as well as the newly created characters folder. Load student created characters into Motion Builder and apply motion from previous capture session to the character via the actor module. Seventh class meeting. Quick review of the use of Autodesk Character Creator for generating modified character designs from templates for use in MotionBuilder and Maya. Have students who missed last weeks class due the visiting artist workshop by Chris Sullivan log in to Autodesk and set up a free account in order to access Character Generator. Demonstrate how to import marker data into Maya from MotionBuilder so that each marker shows up as a locator (null object). Dissect the technical process used in making the abstract animation project, Handle, that Alexander Cruz created in the class last year. Suit up a Gina so that Cameron and can direct motion capture sessions for their respective projects. Discuss the unique issues and challenges that each project presents. Have the whole class work with loading the live data data into MotionBuilder and applying it to their character designs. Eighth class meeting. Meet in the Black and White Studio (A404) to discuss Rachel Ho’s upcoming project (slated to premiere on Thursday). Visiting mocap expert John Brennan will demonstrate best practices with PhaseSpace and MotionBuilder. The use of low cost alternatives to professional mocap systems such as the Kinect will be discussed and/or demonstrated. Continue work on student projects in preparation for the following week’s course exhibition in the B&W Studio Gallery A404. Ninth class meeting. Set up and run student projects in the A404 B&W Studio in preparation for the Thursday afternoon and evening course exhibition. Tenth class meeting. Reset the PhaseSpace Impulse mocap system in F105. Review documentation of the course exhibition and critique the event. Twelfth class meeting. Meet in the CalArts exbox teleport for a a GoToMeeting teleconference and demonstration arranged by Alex Czarowicz, Vice President of Sales, Organic Motion, Inc. His team demonstrated various aspects of their markerless motion capture system which relies on an array of multiple video cameras viewing a white cube with green floor stage. Students were able to ask questions and request particular performances by the team conducting the live motion capture demo session. A soon to be released 120Hz system was demonstrated and its properties discussed. Alex provided us with a link to a zip file of some current data samples that can be loaded into MotionBuilder. Thirteenth class meeting. Final class session and party!